Summer 2018 went out on a hot note, with September temperatures lingering in the ‘90s and not a lot of rain recently in my parts of the South – despite the hurricane devastation in the Carolinas. The heat does not bother me; the last days of summer are the sweetest because it’s almost gone. I always lament the things I didn’t do to take advantage of the longer summer days. This year, I didn’t sit in my back yard much and that’s a loss. I measure the progress of the warmest months by the fruit that comes and goes. Strawberries appear in April and are disappearing by the time the first Chilton County peaches arrive around Mother’s Day. Blueberries and blackberries come soon after, with local watermelons and cantaloupes appearing near Independence Day. Figs come around a little later. The fig tree yield has been iffy in recent years. 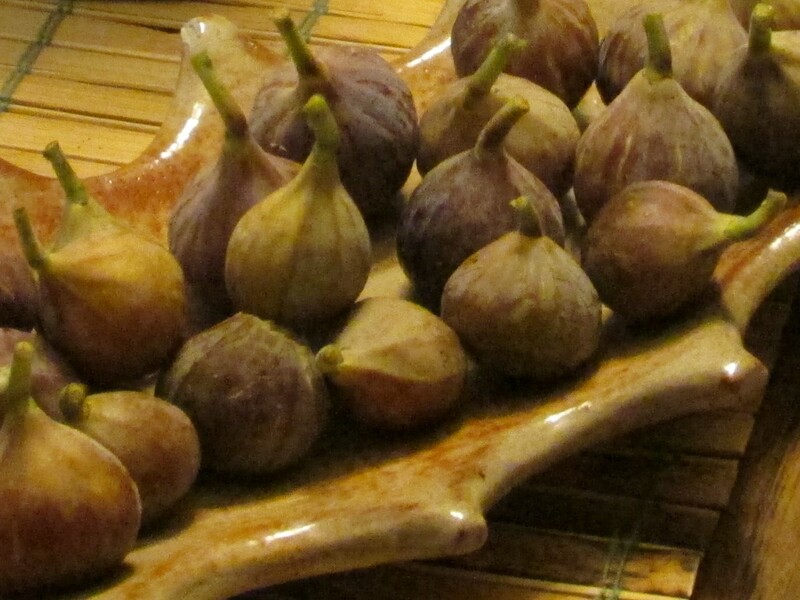 Even though I heard a grocery clerk bragging to a neighbor about the bounty on his family’s fig tree, I didn’t see a lot of fig action at the various farmers’ markets. I have often written about the community that comes together at the special dinners at the Alabama Chanin Factory in Florence. It has enabled me to meet people I might have never known. In the years that I have been attending the benefit dinners in Florence, two gentlemen were among the most regular attendees. We did not actually meet them until we were seated at a table together earlier this year. They are Milton and David, a father and son from Corinth, Mississippi, who regularly make the trip to Alabama Chanin’s factory for the singular dinner series that happens in that place. On that first meeting, Milton, the father, entertained us with stories of the historical research he and his late wife, Stephanie, have done in and around Corinth, his hometown. He also mentioned, in passing, the fig trees on their property – collected over the years of their marriage and annually producing a nice harvest. My friend, Anne, was particularly interested in acquiring a fig tree for her house and Milton shared a recommended source, www.ediblelandscaping.com. At the end of the most recent Florence dinner in August, Milton handed me a small jar labeled “Stephanie Sandy’s Figs.” Inside were “Milton’s North Carolina Style Whole Fig Honey-Lemon Amaretto Preserves.” I saved the jar for the last days of summer and ate the delectable fig preserves with some of my favorite local Humble Heart goat cheese and a piece of Mrs. London’s bread, another favorite from local farmers’ markets. The combination was delicious; it tasted exactly like the last days of summer should. In the last week of summer, when I got home from work on a late afternoon, a deer was calmly grazing across the railroad tracks behind my house. I got out of the car and watched him. It’s rare to see a deer out in the open in the hottest part of a hot day. I normally only spot them behind my house at night. This daytime deer stopped grazing and looked back at me for a moment. Then, he slowly disappeared into the cool of the trees. It has been so dry here for the past few weeks, I suspect he had gotten bold in search of food and water. On the morning of the last full day of summer, I woke before sunrise to the sound of rain against the windowpanes. By the time I got up and looked out the window, it had stopped. 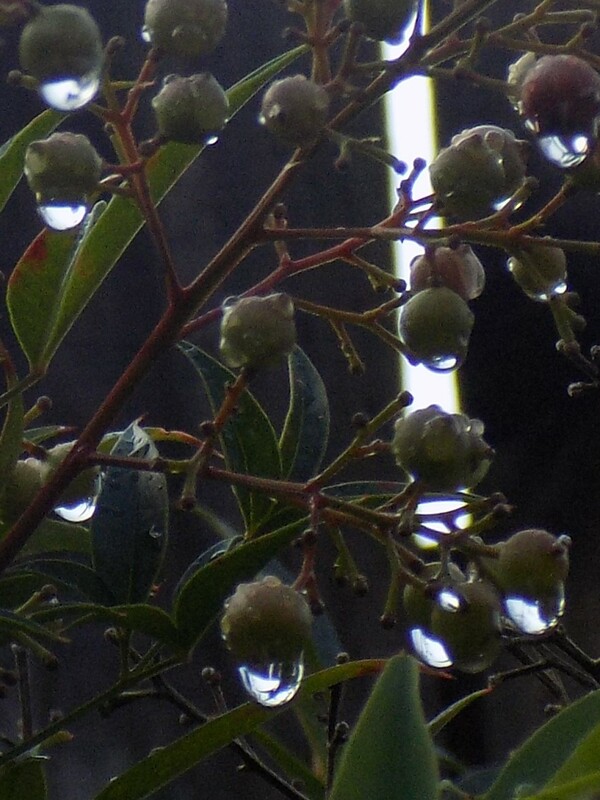 As I packed my car, I noticed single drops of water hanging on each of the berries of a backyard shrub. They seemed to be a token of a summer passing away and a promise of new seasons to come. That evening, on the last full day of summer in Birmingham, it was hot and dry with clouds worthy of a biblical Renaissance landscape floating overhead. The neighborhood ice cream shop in Bluff Park atop Shades Mountain was packed to overflowing with people gathered in the parking lot and on benches outside the little shop. Suddenly, from one of the overlooks along Shades Crest Road, the sky turned pink and gold and the setting sun shone bright orange across Oxmoor Valley. I had left my camera at the house, but stopped to savor the display. The next day, just after the Alabama game, I drove back up the mountain with camera in tow to see if I might catch a repeat of the previous day’s stunner. But fall had arrived; the sky was grey and overcast and the setting sun was a dingy circle partly visible through ominous clouds. On the other side of the mountain, an almost full moon peeked through more clouds in a still and colorless dusk. This entry was posted in figs and tagged Alabama Chanin Friends of the Cafe, Alabama fruits, Alabama harvest, Alabama summer, Edible Landscaping, fig preserves, Humble Heart goat cheese, London Bread on September 24, 2018 by gedwardjourney. "Do You Know What It Means to Miss New Orleans?" "Green Green Grass of Home"
"Music from the Hearts of Space"
Bright Star "Night in New Orleans"